Live large with this Fat Tuesday feast, complete with New Orleans's best dishes and libations. Aside from being New Orleans’s most famous dish, gumbo has long served as a metaphor for the Big Easy’s rich culture, with its heady stew of influences from the Creoles, Cajuns, French, Spanish and African-Americans who have occupied the city over its 294-year history. That history, evident in New Orleans’s musical, culinary and social traditions, is celebrated annually when NOLA plays host to the world’s largest masked party, known as Mardi Gras. For residents, the colorful celebrations and raucous parades held on the bead-strewn streets of the French Quarter have an almost spiritual purpose. 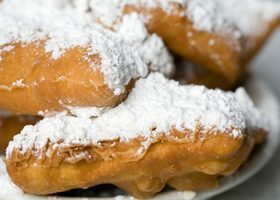 Mardi Gras (French for Fat Tuesday) is the last day before the Christian season of Lent, beginning on Ash Wednesday, when followers traditionally fast, refrain from eating meat or give up selected indulgences. Facing a prolonged period of sacrifice, there’s room for some serious indulgence, Southern style, and it goes way beyond gumbo. “Shrimp Creole over jambalaya, fried chicken, milk punch and king cake are just a few of the parade foods,” says Lally Brennan, co-proprietor of New Orleans’s landmark restaurant, Commander’s Palace. A proper Mardi Gras parade-watching party might include “masks and costumes, beads. Lots and lots of beads. And plastic cups for drinks to sip while watching the parade,” notes Brennan. In celebration of this uniquely American fête, a last chance of sorts to give in to the pleasures of food and flesh, we talked to some of New Orleans’s top chefs for tips on putting together a full-throttle Fat Tuesday feast complete with traditional recipes, wine pairing suggestions and killer cocktails. With Lake Pontchartrain to the north and the Mississippi River to the south, New Orleans is surrounded by waterways. With many sections of New Orleans below sea level, this proximity to water proved tragic during Hurricane Katrina in 2005. But much of New Orleans’s identity is tied to its closeness to the Gulf of Mexico: scenic vistas, riverboat cruises and amazingly fresh seafood. No Mardi Gras celebration is complete without oysters. Preheat a grill to 400°F. In a small saucepan, melt the butter on a stove over low heat. Stir in the garlic, pepper, thyme, salt and hot sauce. Simmer the mixture for 10 minutes. Spoon half of the garlic-butter mixture over the oysters and sprinkle with half of the grated cheese. Place the oysters on the prepared grill and cook for 2–4 minutes. When the oysters are cooked to your preferred doneness, top them with the remaining garlic butter and cheese. Serve immediately with French bread. Makes 12 oysters. “There are several different directions you can go with this classic New Orleans dish,” says Dan Davis, sommelier at Commander’s Palace. “I love oysters with Muscadet. The wines are fresh, crisp and well-suited to shellfish. From Commander’s cellar, we like the 2005 Pierre Luneau-Papin Pueri Solis Muscadet de Sèvre et Maine.” Since aged Muscadet can be difficult to obtain, feel free to pour a more recent vintage. This decadent, quail-based gumbo recipe was created by Folse for Craig Claiborne of The New York Times. Claiborne asked Folse to come to his home on Long Island to create a special dinner depicting the evolution of Cajun and Creole cuisines, and this unusual dish was the perfect choice. In a 2-gallon stockpot, heat the oil over a medium-high flame. Whisk in the flour and stir constantly until the mixture turns golden brown. Add the onions, celery, bell peppers and garlic, and sauté until the vegetables are wilted, about 3–5 minutes. Stir in the mushrooms and tasso, and cook for an additional 3 minutes. Stirring constantly, add the chicken stock one ladle at a time. Bring the gumbo to a rolling boil, then mix in the thyme. Reduce the heat and simmer for 30 minutes. Adjust the seasoning using salt, pepper and granulated garlic. Place the stuffed quail into the gumbo and allow to simmer for another 30 minutes. When the quail are tender and the legs easily separate from the bodies, remove the birds to a platter and keep warm. Pass the gumbo through a fine-mesh sieve, making sure to reserve the liquid and discard the solids. Return the liquid to the pot. Add the quail, green onions and parsley, then return the gumbo to a simmer. Season each quail’s cavity with salt, cracked black pepper and granulated garlic. Season the cooked white rice to taste with salt, pepper, granulated garlic, filé powder and chopped parsley. Shuck the oysters over a small bowl, making sure to reserve the oysters’ liquid. In a small sauté pan set over low heat, poach the oysters in the reserved liquid until they’re partially cooked through, about 3–5 minutes. Stuff each quail’s cavity with 1 tablespoon of the rice mixture, 1 slice of andouille and 1 oyster, then top off each cavity with another tablespoon of rice. Continue this process until all of the birds have been stuffed, then cover with plastic wrap until needed for the gumbo. Place 1 quail in the center of each soup bowl and cover with the gumbo liquid. Serves 12. *Although it’s best to use boneless quail for this recipe, bone-in quail may be substituted if boneless are not available. Opened in 1959, this family-run bakery ships thousands of King Cakes each Mardi Gras, and has even won two Guinness World Records—one in 2010 for creating the largest King Cake, which looped around the Superdome. A long-standing Mardi Gras tradition, the ring-shaped confection is decorated with green, purple and gold, the colors of Mardi Gras. Baked into each cake is a tiny plastic baby or coin. Tradition has it that whoever gets the slice of cake containing the trinket has to host a Mardi Gras feast the next year. In a stand mixer set on low speed, mix the sugar, salt and shortening until well creamed. Add the eggs and continue to mix until the eggs have incorporated. In a small bowl, dissolve the yeast in the milk, then add in the extracts and stir. Pour the milk mixture into the egg mixture and continue to mix over low speed. Slowly add the flour and mix until the dough tightens, but doesn’t become tough, about 2 minutes. Remove the dough from the mixer and form it into a ball. If the dough feels too sticky, sprinkle it with some of the tablespoon of flour. Cover the dough with a clean kitchen towel and allow it to rise for 1 hours. When dough has risen, use a rolling pin to roll it into a rectangle, sprinkling the dough with the remaining flour to prevent sticking, if necessary. Brush the dough’s surface with the oil, making sure to coat it evenly, then sprinkle the cinnamon-sugar blend liberally on top. When the surface is coated, fold the dough in half lengthwise. Cut the dough into 3 long ropes. Arrange the dough ropes vertically side-by-side on the work surface, and braid the dough as you would hair. Once braided, use your hands to gently shape the braided dough into a ring. Place the shaped dough on a parchment paper-covered baking pan, and allow the dough to rise again until it doubles in size, about 1 hours. After the dough has risen for the second time, preheat the oven to 370°F. Sprinkle the dough’s surface with the colored sugars. Bake for 12–15 minutes until the surface turns golden brown. Let it cool slightly before slicing and serving. Serves 8. *The cinnamon-sugar blend may be purchased in many markets. It can also be made by combining cup sugar with 1 tablespoon cinnamon. In a small bowl, whisk together 1 cup of the sugar with the purple food coloring. Mix well until the sugar is evenly colored. Repeat this process in separate bowls to create the yellow- and green-colored sugars. Makes 3 cups. Beverage Director Jose Montalvo of the Hyatt Regency in New Orleans recommends Errazuriz’s Late Harvest Sauvignon Blanc from Chile. “It’s a great dessert wine and the perfect complement to King Cake,” he says. The floral aromas and textural richness of a fortified Muscat, like the Les Petits Grains Muscat de Saint-Jean de Minervois from Les Vignerons de la Méditerranée would also work. In a city well known for its hurricanes, it’s no surprise to see rum-spiked punch served at parties in New Orleans. This tea-accented libation is a great party pick for a Mardi Gras meal, as it can be made several days ahead of time. Combine the tea, liqueur, rum and sour mix in a large punch bowl and mix well. Serve over ice in oversized wine glasses, and garnish with seasonal fruit and mint sprigs. The fruit may also be added to the punch ahead of time to allow the flavors to marry. The punch may be made and refrigerated up to 5 days in advance. Serves 6–8. Prepare a simple syrup by combining the sugar and water in a small saucepan set over medium heat. Stir the mixture continuously until the sugar has dissolved, about 5 minutes. Remove the pan from the heat and allow the simple syrup to cool. When the mixture has cooled, add the yuzu juice and mix well. Makes 2 cups. *If yuzu juice isn’t available, cup fresh lemon juice and the zest from the squeezed lemon may be substituted. This cocktail is a great sidekick to grilled oysters. Combine all ingredients in a mixing glass filled with ice. Stir and strain into a coupe glass. Created to honor the Queen of Mardi Gras at the extravagant carnival balls where elegant foods are a major part of most functions, this soup is a hit. Featuring sumptuous ingredients, it’s traditionally served in large, gilded tureens. In a large stockpot, bring chicken stock to a simmer over medium-high heat. Poach the chicken breasts in the hot stock for 10–15 minutes, or until thoroughly cooked. Remove and allow to cool. When cool, dice the chicken into ¼–inch cubes and set aside. Add the wild rice into the simmering stock and cook for 30 minutes, stirring occasionally. Add the white rice and cook for an additional 15 minutes, or until tender. In a separate saucepan, melt the butter over medium-high heat. Whisk in flour, stirring constantly until a white roux is achieved. Next, add the carrots, bell peppers, thyme, sage and chives, and let cook for 3–5 minutes. Add the roux mixture to the chicken stock, stirring constantly. Add the heavy whipping cream, stirring constantly and bring the mixture to a boil. Season with salt and black pepper, add diced chicken and cook for an additional 2 minutes. Additional stock or water may be needed to retain a soup-like consistency. Adjust seasonings, if necessary, according to taste. Serve in soup bowls over fresh garlic croutons. Serves 6. Wine Recommendations: Rolly Gassmann 2004, Pinot Gris (Alsace). This complex wine, full of ripe citrus and nutty notes with a lush texture, complements the creaminess and intense spices of the soup. Legend has it that the Sazerac was created by Antoine Amadie Peychaud, a Creole apothecary who relocated to New Orleans from the West Indies in the early 19th century. Made famous at the Sazerac Bar in New Orleans, this libation was declared the city’s official cocktail by the House of Representatives in 2008, and features Peychaud’s Bitters. It’s the perfect pairing with Death by Gumbo. Fill a rocks glass with ice and let chill. In a second rocks glass, combine the Cognac, whiskey, simple syrup and bitters. Fill with ice and stir to chill. Scoop the ice out of the first rocks glass once chilled. Add absinthe, and swirl the glass to coat the inside and discard the excess. Strain the chilled cocktail into the coated glass, twist the lemon peel and drop it into the drink to garnish. To make the southern comfort apricot glaze: Combine 1 cup Southern Comfort, apricots, corn syrup and red pepper flakes in a small skillet with vegetable oil and bring to a simmer over medium heat for 10 minutes, stirring occasionally until the mixture is thick and reduced. Remove from the heat and stir in the remaining 2 tablespoons of Southern Comfort. To prepare the wild boar: Turn on the grill to medium-high heat. Rub oil on all sides of wild boar racks and season with Creole seasoning. Place the rack halves on the grill, fat side down, and cook for about 10 minutes, or until the fat starts to crisp (watch for flare-ups as the fat renders from the meat). Turn over and cook the other side for about 8 minutes, or until an instant-read thermometer inserted into the thickest part registers 130ºF (for medium-rare.) Once achieved, brush half of the glaze all over the racks and grill for 30 seconds more on each side. Transfer the boar onto a cutting board and cover with aluminum foil to keep warm. Let cool for 10 minutes. Cut between each bone and partition into separate chops. Arrange the chops decoratively on a platter and serve the remaining warm glaze on the side for dipping. Serves 6. This apricot brandy-based libation complements the Southern Comfort-Apricot glaze on the wild boar. Combine ingredients, shake well and top with sparkling wine. Garnish with a lemon twist.